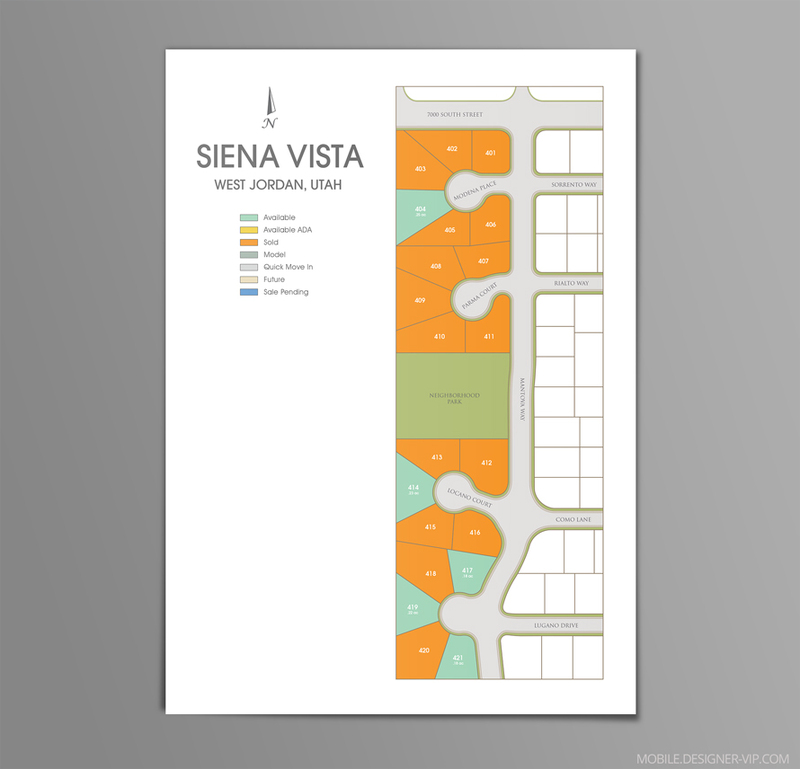 Design Property plat map Siena Vista. I am a real estate developer. I want to create a neighborhood site map for marketing purposes. The attached file (Ranch plat map) is the subject neighborhood. I’d like it to look more like the other attached file. Can you do that? All I have is a pdf file. I’ve got 5 neighborhoods I’d like to do. This flyer shows the neighborhood and the sold lots. LOCATION: Siena Vista is located west of the southwest corner of 7000 S and 5600 W in West Jordan, Utah. LOCALITY: This property is centrally located within the Salt Lake metropolitan area, which consists of 1.4 million people. It is less than 19 miles from downtown Salt Lake City and approximately 14 miles from the Salt Lake International Airport. So it is in close proximity to Bangerter Highway and the future 6-lane Mountain View Corridor (currently under construction) making this area ideal for access to regional transportation. Also it is located next to 7800 South and UTA’s future Bus Rapid Transit line on 5600 West. With easy access to major transportation corridors, this location provides opportunities for shopping, working, and recreating anywhere in the Salt Lake Valley. Created high quality vector plat map (sold property lots map) in Illustrator format (Ai, eps, pdf) for a company with turn round – ~3 days.